Brahm Callahan (left) and Michael Meagher in Aspen, Colo.
Michael Meagher and Brahm Callahan made history in May. 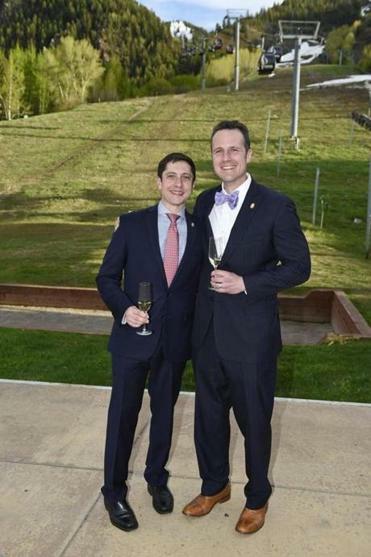 The two became the first wine pros living and working in Boston to each earn the coveted title of master sommelier. There are only 229 worldwide. Weeks after the exam, both are still on cloud nine, grateful and a little incredulous at what they accomplished. Of the 63 North American candidates who attempted what many regard as the wine industry’s most arduous exam, Meagher and Callahan are among seven who passed this year. The exam is invitation-only, conducted annually, and judged by master sommeliers. A candidate must have passed three prior certification levels administered by the Court of Master Sommeliers, the international organization in charge of the process. Becoming a master somm means Meagher, 35, import specialist for Jackson Family Wines (he educates wine sales reps in Greater Boston about the portfolio), and Callahan, 31, wine director at Grill 23 & Bar in Back Bay, completed tests that show they can sniff a glass and identify the wine, understand laws governing the industry, and much more. It also means that years of studying paid off. In May, the two flew to Aspen, Colo., where the Court of Master Sommeliers, Americas gave the oral examination, which is in three parts. The first is a test of theory. Judges can ask candidates anything — from the aging requirements of a particular class of pours to the minimum grams of residual sugar in a specific sweet wine. The second is a 25-minute blind tasting of six wines. Candidates identify pours based on what they see, smell, and taste in the glass. A service portion requires demonstration of tableside skills. A sommelier can only take the exam once a year, and has three consecutive years in which to pass all three parts. Come up short, and a candidate has to start all over again. Meagher, who is chairman of the Boston Sommelier Society, made his first attempt in 2010, the same year that Callahan decided he too would make that his goal. What kept both going was the support of their wives, peers, and the master sommeliers who mentored them. Both count Seattle-based master somm Shayn Bjornholm in their long lists of mentors. Now as master somms themselves, the two are helping other up-and-coming wine professionals. Meagher calls it “getting people up their own personal mountains.” Callahan lends support to the dozen certified sommeliers at his restaurant, several of whom are working toward the exam. “You learn in this process that you can’t do it alone,” he says. Both feel that their accomplishments reflect the growth and vitality of the Boston wine scene. Not too long ago, they were among just a handful of certified sommeliers in town. Now they see avid interest among wine pros to professionalize, as well as an increasing eagerness among restaurant guests to learn about what’s in their glass. If it’s Meagher or Callahan who is explaining the wine to you, ask them anything. Chances are, they have the answers at their fingertips.